Today is a day off in the US, and we can expect quiet American trading session. Today is the day of Martin Luther King and the main exchange, the volumes of which we analyze, closes at 21:00 Moscow time. Opening will be usual at 02:00 on January 22. This is a CME exchange. Forex market will be open, but the CFD for metals, indices and raw materials will also have an abbreviated schedule. However, the market has not gone away; in terms of volumes, the downward movement for us is a priority for us. And the main scenario is a test of resistance 1.1380-1.1423 and a downward movement towards 1.1345 and less likely today 1.1310. To this movement adds fuel to the fire and the regulator. Mario Draghi and other members of the ECB have repeatedly said the presence of inflation risks. And now it comes to the fore. Or rather, the press conference of the ECB, which will be held this Thursday. If Draghi convinces the markets that the increase in rates is being postponed this year, it will put pressure on the Euro as a whole, and the EURUSD can be expected to go down. However, this is not soon, so you can try to consider an alternative scenario of movement. This is a breakdown of resistance 1.1423, and then you can try to buy with a goal of 1.1460, and if you are lucky with a fundamental background, then 1.1520. The price fell to support at 1.2895-1.2825, which we talked about in the last review. Should you buy? Well, if the entrance has already taken place, then it makes no sense to add trades. Wait at least 1.2970. 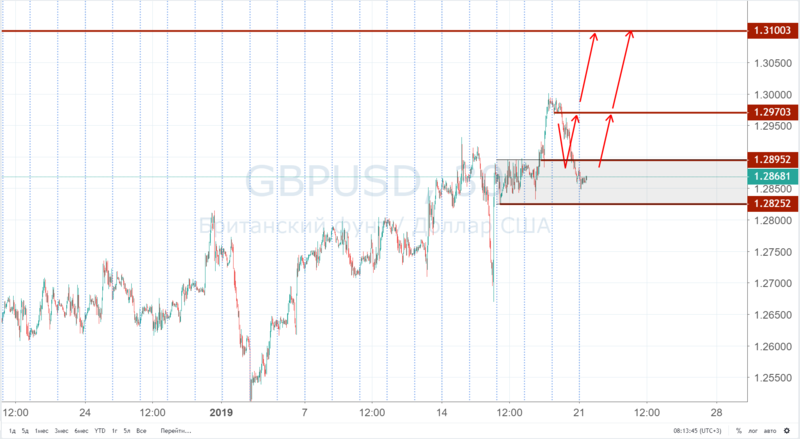 Today, the British government will propose a plan to resolve the issue with Brexit, and this may have a positive impact on the British pound. True, it can have a negative impact. That is why we focus on the fact that if there is a position, then we are waiting. If not, then we look at the news background and the manifestation of the initiative of buyers. For example, if we see a breakdown of 1.2895 up, then we can say that there are buyers, and count on continued growth to 1.2970 and 1.3100. But on the other hand, the emergence of prices below the 1.2825 breaks our scenario with purchases, and makes, at least for now, refuse to trade on this instrument. Although it is likely that the absence of America in the auction will lead to the fact that we will not see a special movement at all. Then, in this case, people without a position win, because a position that does not add or reduce a deposit to a certain value psychologically exhausts and tests a market participant’s strength. Keep your head cold.